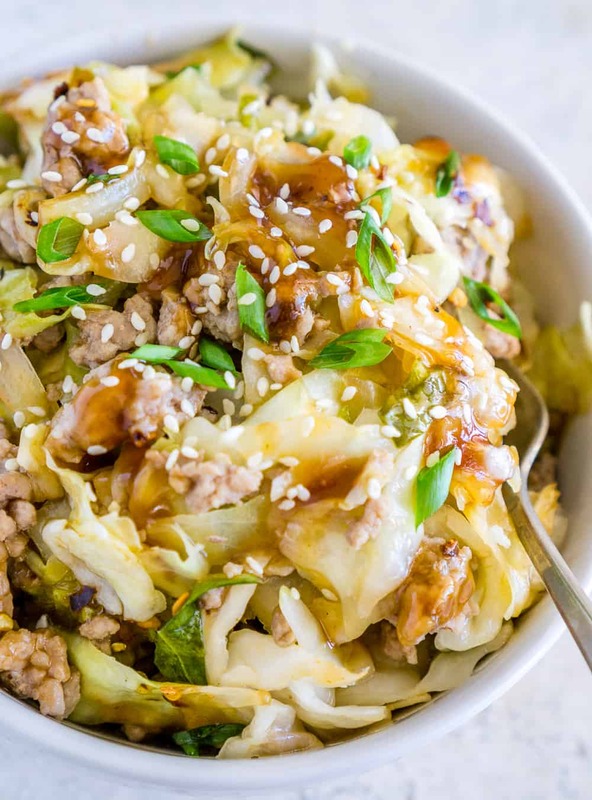 This quick and easy Sweet and Sour Cabbage Stir Fry with Ground Pork will get your taste buds dancing! Serve over noodles or rice, or on its own for a light grain-free meal. Read the full post for a few substitution ideas and tips for making this recipe. When I mentioned to my husband that I am making sweet and sour cabbage, his response was “oh. uh, why?” In his mind he pictured some kind of sauerkraut stir fry so I can’t blame him for his initial reaction. I can blame him for doubting my recipe idea though. Does he really think I would feed him something that tastes bad? Does he have no faith in my cooking? So many questions. 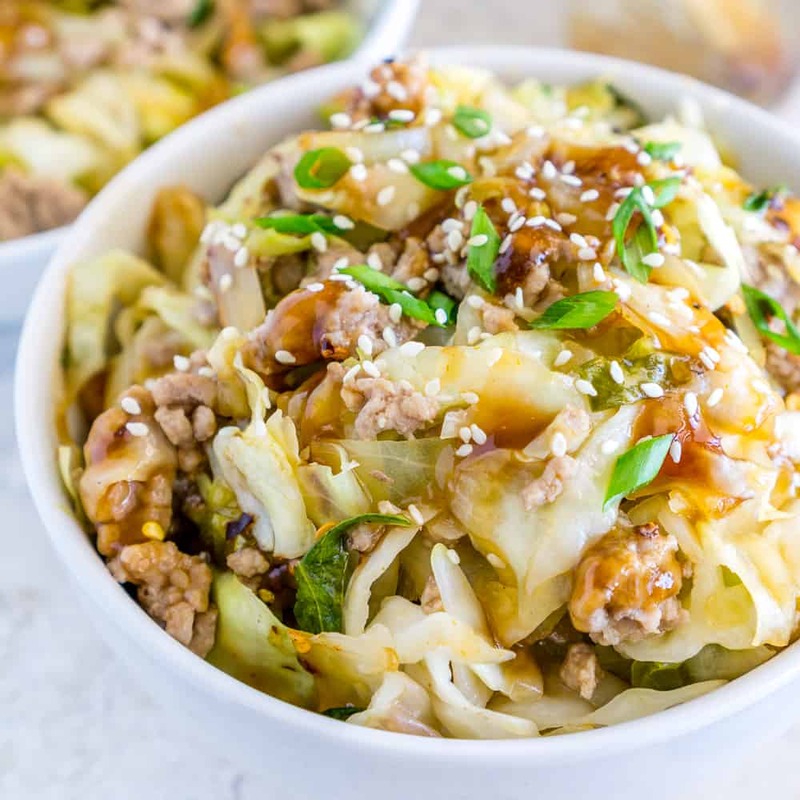 This Sweet and Sour Cabbage is a delicious crunchy stir fry made with a sauce that is similar to the sweet and sour sauce you get from Chinese takeout places… but without the artificial color or flavors. 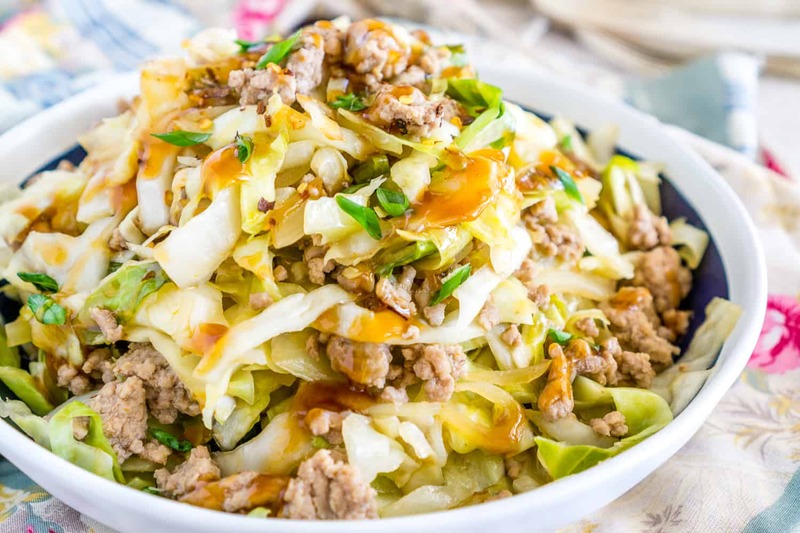 In this dish, crunchy cabbage and browned ground pork are tossed together in with the tasty sweet and sour sauce. 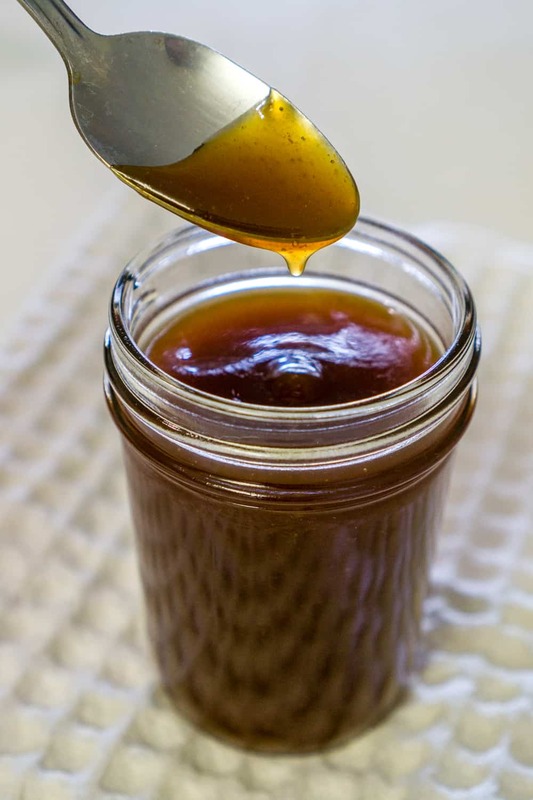 The sauce is a tasty, tangy sticky sweet sauce that is a perfect addition to stir fry. It’s very easy to make from scratch with ingredients that you probably have in your pantry. The sauce comes together while you’re cooking the rest of the recipe, so it actually doesn’t take any extra time to prepare the sauce. 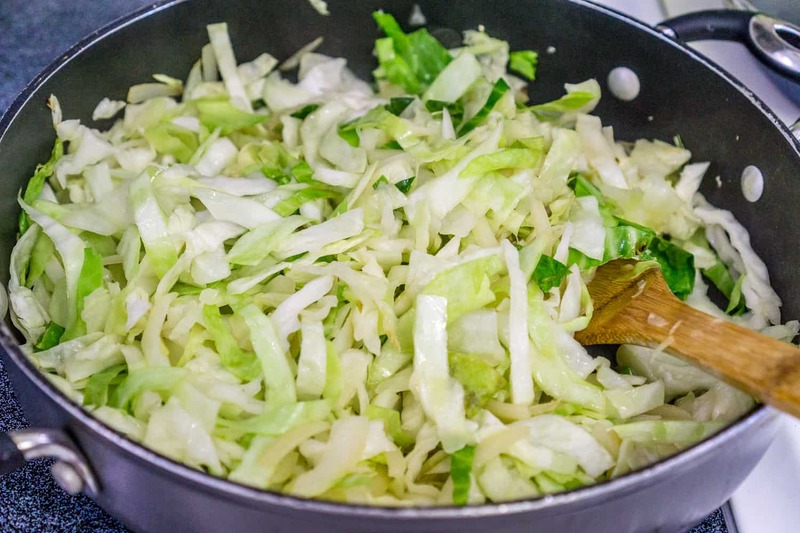 The recipe below makes just enough sauce for this cabbage dish, so if you would like to have some left over to use in another recipe, feel free to double the sauce recipe below. The sauce will keep well for up to a week in the refrigerator in a sealed container. You can use the sauce in a more traditional stir fry recipe (such as with sliced chicken, peppers, snow peas, zucchini), or use it as a dipping sauce for chicken satay, meatballs, or shrimp. You can also spice up the sauce by adding a squeeze of sriracha or a generous pinch or crushed red pepper flakes. 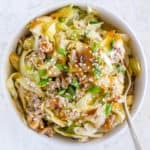 I absolutely love this recipe because it uses a large amount of cabbage that cooks down into a crunchy and tender stir fry. It’s a great way to eat a large portion of vegetables in one serving. If you want, you can grate a carrot or two and cook it with the cabbage. It’ll add a burst of color and nutrients to this dish. Ground pork is the protein in this recipe because pork is a very versatile ingredient that goes well with sweet and sour flavors (I mean, have you seen my Maple Glazed Pork Chops? Or my Honey Sriracha Glazed Pork Chops? Or my Pork and Vegetable Kebabs with Pineapple?). 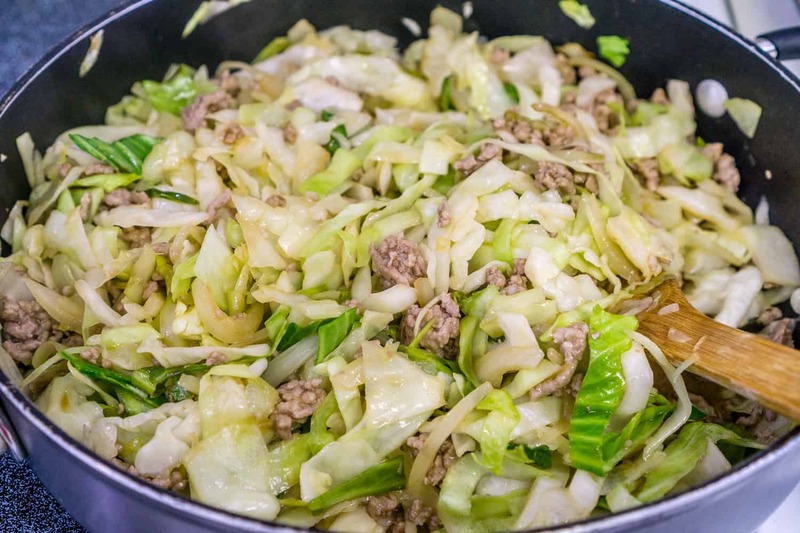 Ground pork is not greasy like ground beef, and it has a great crumbly texture that works really well with crisp sauteed cabbage. If you’re not into pork, you can certainly use thinly sliced chicken breast in this recipe instead of pork. Then, add the sweet and sour sauce (reserving a few tablespoons for garnish) and remove from heat immediately. Transfer to a serving plate or directly into your bowls. Top with garnish: a drizzle of sweet and sour sauce and sliced scallions, toasted sesame seeds, and/or red pepper flakes. This recipe can make a great light meal on its own if you are trying to keep it healthy, or you can serve it over rice, over thick noodles such as linguine or udon (sort of a lo-mein type of situation), or over some super thin rice noodles. It will taste great either way, and the extra sauce from this dish will give lots of flavor to your rice or noodles. Make extra sauce if you like. Add spice to the sauce if you like. Use the extra sauce in other stir fries or as a dip. Serve this over rice or noodles, or on its own. Try a variation of this recipe, such as adding a grated carrot to the sliced cabbage, or using sliced chicken breast instead of ground pork. 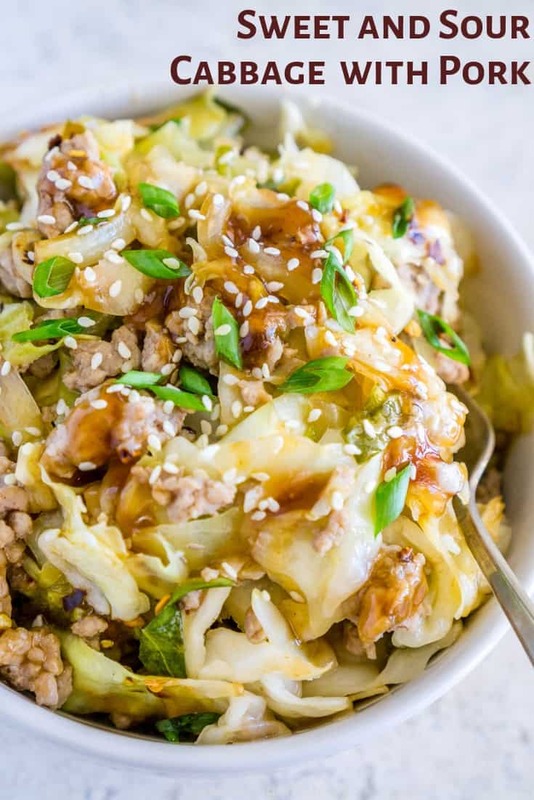 A few more easy cabbage stir fry recipe ideas from Babaganosh. 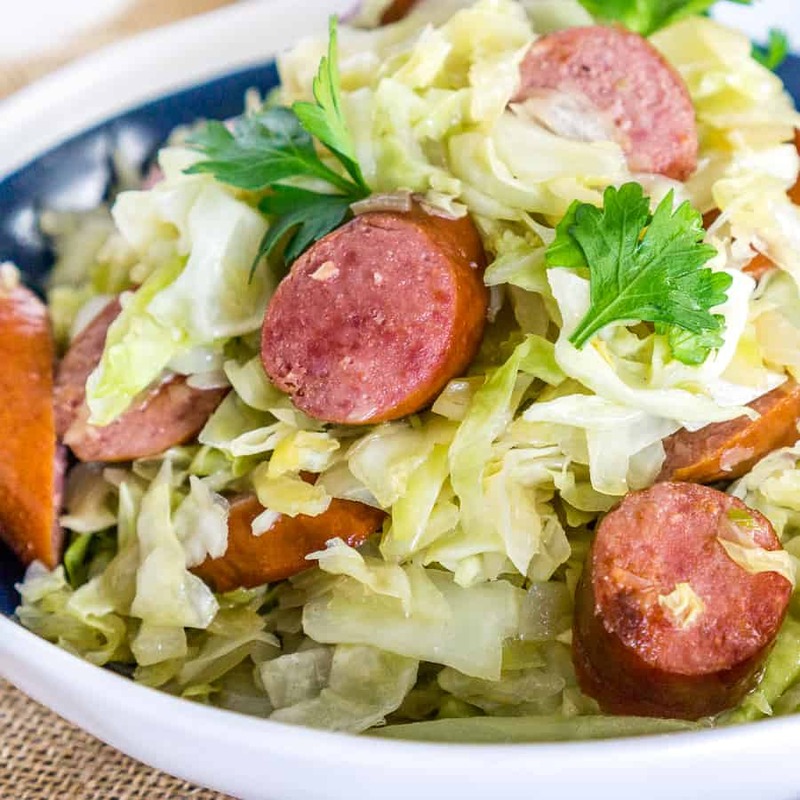 One of the most popular recipes on my blog and in my house, this quick Sauteed Cabbage and Kielbasa recipe is full of flavor. 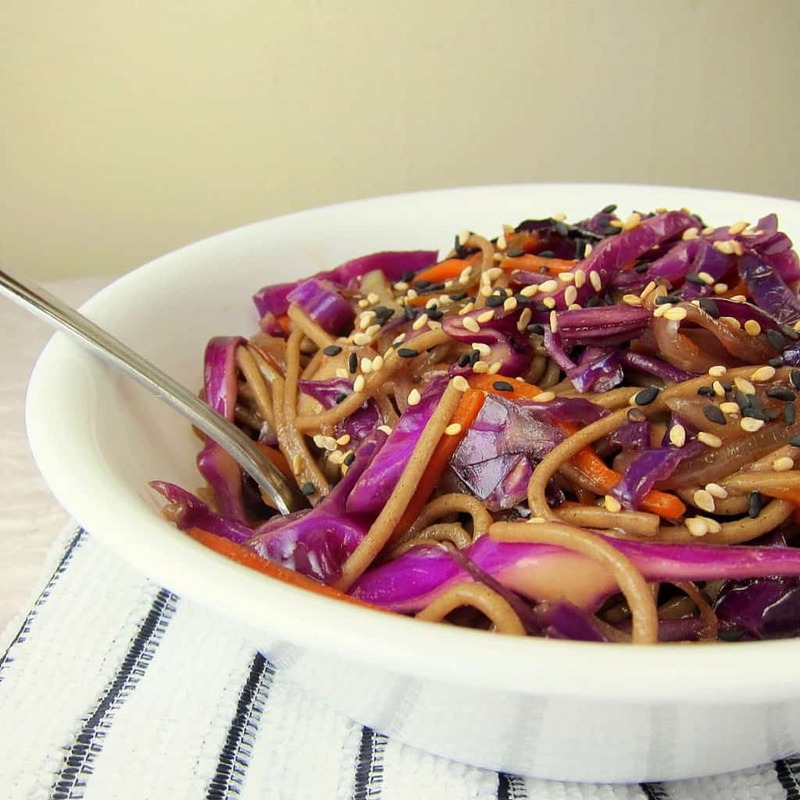 Purple/Red Cabbage Stiry Fry tossed with soba noodles and sesame seeds in a light and flavorful stir fry sauce - tasty and healthy! One of the first few recipes on my blog (can't you tell by the awful pictures?? 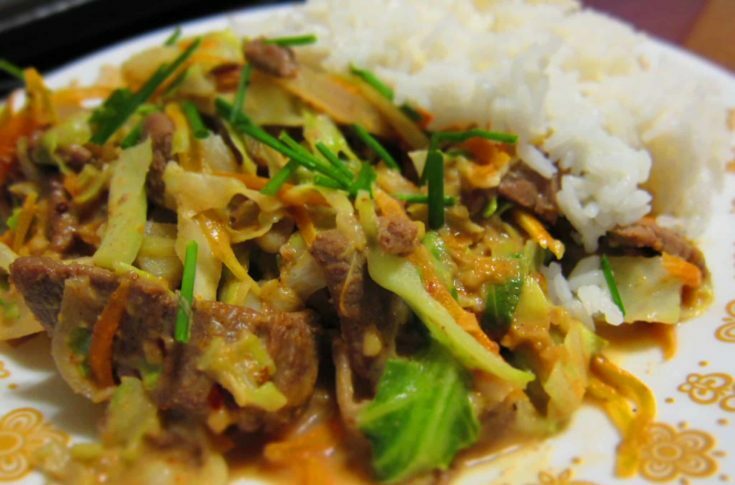 ), this Beef and Cabbage Stir Fry with Peanut Sauce is SO tasty! So ignore the picture quality and make this recipe for dinner this week! Heat 1 tablespoon olive oil or sesame oil in a large skillet with high sides. Add the ground pork and let it cook for 2 minutes over high heat undisturbed, so that the bottom browns. Season with salt. Break up the meat with a spatula and continue to cook over high heat stirring frequently for about 5 minutes, or until the pork is fully cooked. Transfer the cooked pork to a large plate or bowl while you work on the rest of the recipe. 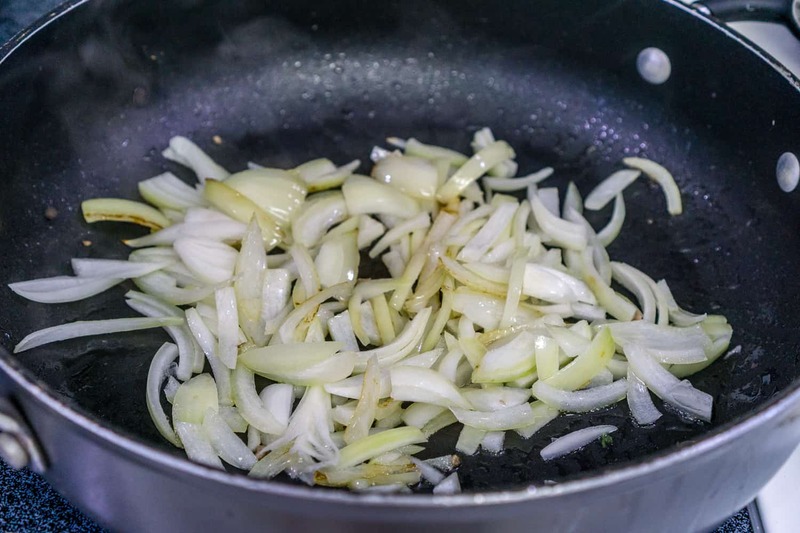 Add a tablespoon of oil to the same skillet and add the chopped onion. Allow to cook over medium-high heat for 1-2 minutes to let the onion caramelize slightly (but don't let it burn), then stir. Add the chopped cabbage and stir. Cover and cook for 3-5 minutes over medium heat. Remove the cover, stir, and continue to cook uncovered for another 3-5 minutes stirring frequently. Combine all the ingredients directly in a small saucepan. Stir with a whisk or a fork and cook over medium heat for about 5 minutes stirring every few minutes, or until the sauce thickens, turns translucent, and takes on a shiny reddish brown color. Remove from heat. 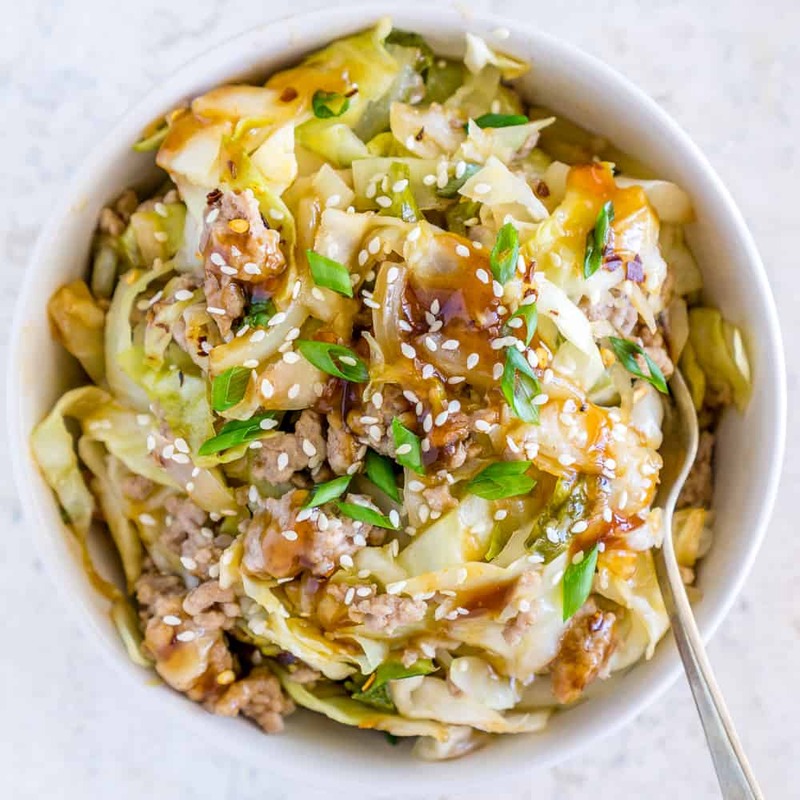 Add the ground pork and the sweet and most of the sour sauce to the cabbage skillet - reserve 2-4 tablespoons of sauce for garnish! Stir and cook for 1-2 minutes, until everything is heated through. Transfer the sweet and sour cabbage to a serving dish or directly to your plates. Add a drizzle of the remaining sweet and sour sauce. Garnish however you like - with chopped scallions, toasted sesame seeds, red pepper flakes, or a drizzle of sriracha. The nutrition facts listed below are just for the sweet and sour cabbage and pork - without rice or noodles. Hi Ali! So glad you liked it. 🙂 The nutritional facts are without the rice – just for the cabbage and pork. I will add that note in so it is more clear. Thanks!